Join some of Sydney’s most outstanding art and art history students for a series of talks on artworks in different parts of the Gallery, primarily from the Gallery’s collection. Inspired by Close to home: Dobell Australian Drawing Biennial 2016 , this year’s series focuses on the themes of narrative, memory and experience. Each week, two students will speak about two different works currently on display. Alec O’Halloran will talk about Martin Tjampitjinpa’s Untitled 2007 in the exhibition Sentient lands . Alec became fascinated by Aboriginal art in the mid 1990s and began looking, reading and travelling as an enthusiastic beginner. His interest turned to Papunya Tula art and its founding artists. He is writing a biography of one of them, Pintupi man Mick Namarari Tjapaltjarri. Rachael Helmore will talk about Paddy Japaljarri Stewart and Paddy Japaljarri Sims’ Yuendumu Doors 2000-01 in the exhibition Yuendumu: of fire and water . Rachael works in arts education and administration, as well as continuing her artmaking practice. She loves to find out what makes other artists tick, and has a particular interest in how mark-making is used to explore lived experiences. She is currently studying a Masters of Art Curating at the University of Sydney. Scarlett Steven will talk about Xu Bing’s Square word calligraphy classroom 1994-96 in the exhibition Beyond words: calligraphic traditions of Asia . Scarlett is currently completing her Bachelor of Fine Arts (Honours) at UNSW Art and Design, majoring in sculpture and installation. Her work and research revolves around the body as the root of all human experience and constructions of gender. Her favourite kind of art is art that makes you laugh! Zhe Zhang will talk about Zhen Wang’s Nine years facing the wall from the late 19th – early 20th century, also in Beyond words . 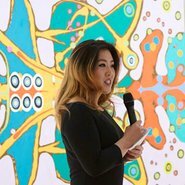 Zhe completed her Bachelor of Arts, majoring in languages and art history, and is currently completing her Masters of Art Curating at the University of Sydney. She enjoys discovering art and emerging artists and hopes to continue this exploration as a curator in the future. Kate Ahern will talk about Angolo Bronzino’s Cosimo I de’ Medici in armour c1545 in the European galleries. Kate grew up in Sydney and studied for a Bachelor of Fine Arts, majoring in painting, at the National Art School. She is currently enrolled in a Bachelor of Arts and Social Sciences at the University of Sydney, majoring in art history. She is interested in how contemporary cultures influence style, and in her talk she will be discussing the rise of mannerism in the courts of Italy. Ellen Bird will talk about Édouard Detaille’s Vive l’Empereur 1891, also in the European galleries. After living in Taiwan and Germany, Ellen returned to Australia to undertake a Bachelor of Fine Arts at the National Art School, majoring in printmaking. Currently in her second year, she has an interest in mythological and historical paintings and is keen to examine these aspects of traditional painting subjects in her own printmaking practice. Jonathan Dennis will talk about Catherine O’Donnell Inhabited space 2015-16 in the exhibition Close to home . Jonathan is in his second year of a Bachelor of Arts, majoring in art history and theory, at the University of Sydney. He works part-time as an art technician in the Gallery’s Conservation Department, having worked for almost a decade in commercial and conservation framing. Marcus James will talk about Nyapanyapa Yunupingu’s works in the Close to home exhibition, including Larrani and Marwat 2014. Marcus is currently studying art history and law at the University of Sydney. He is interested in combining his specialisations for a career in art advocacy, although he is also tempted by furthering his studies in art history. He is fascinated by the ethics surrounding the curation of Indigenous Australian art.